We delayed at least 2 years to convert our main websites from Desktop visiting support only to responsive UI, which means a Mobile-Friendly website. How we know whether our website is mobile-friendly or not mobile-friendly ? The easiest way is using existing online tool. We met multiple tools in past couple of years, but along with the time changing, the mobile-friendly criteria was keeping on changing also. If you move your WordPress site to a new file directory only (not moving hosting), you might be able to see your new web home page is OK, but all the single articles no more shown if you click article title from home page. You will get NOT FOUND error message. The one reason is very possible: You just need to change Permalinks in Admin panel, and click Save button. you will see all your articles work now. 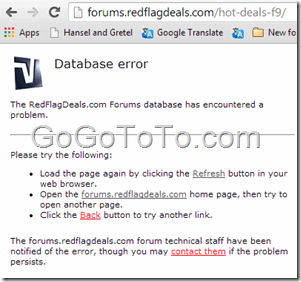 The RedFlagDeals.com Forums database has encountered a problem. Open the forums.redflagdeals.com home page, then try to open another page. The forums.redflagdeals.com forum technical staff have been notified of the error, though you may contact them if the problem persists. So what is happening ? 1.5 month passed, the last record data is June 05, the rank o Alexa was 1,610,695. Today, the rank is 1,110,038. Let a website traffic rank up is hard. Almost 9 months passed again. The traffic rank in Alexa record is still 1,610,695, The last record was in 2010 Sep, the rank was 3,737,552.